Welcome Back! Today, we will be watching a movie called The Shepherdess and the Chimney Sweep. It was directed by Paul Grimalt (La Table Tournante, La Flute Magique, Le Petit Soldat) in 1952 France. There are two versions of this movie. It was titled The King and the Mockingbird in 1980, but it began in 1948 as The Shepherdess and the Chimney Sweep. 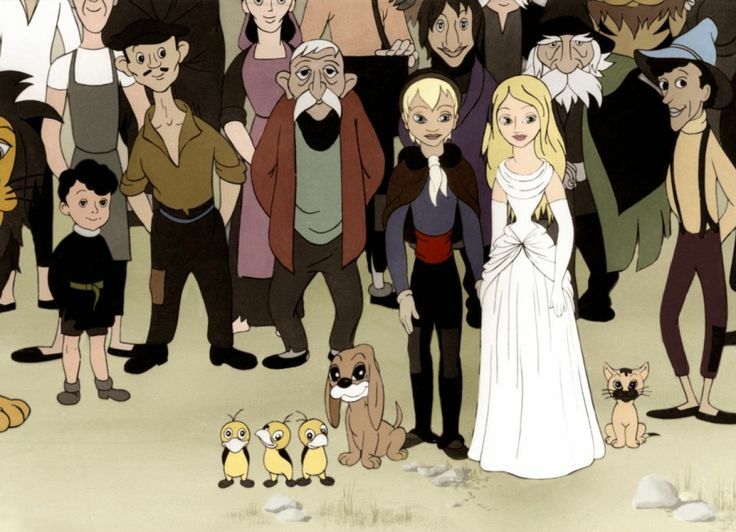 The film was a collaboration between Grimault and French poet and screenwriter, Jacques Prevert (Le Petit Claus et le Grand Claus, The Lovers of Verona, The Hunchback of Notre Dame). The film stopped production and was released unfinished by its producer, without Grimault’s or Prevert’s approval. 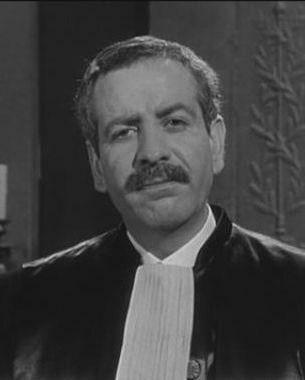 During the 1960s and 1970s, Grimault obtained the rights to the film and was able to complete a new version as they originally intended, in 1980 (30 years after they started). 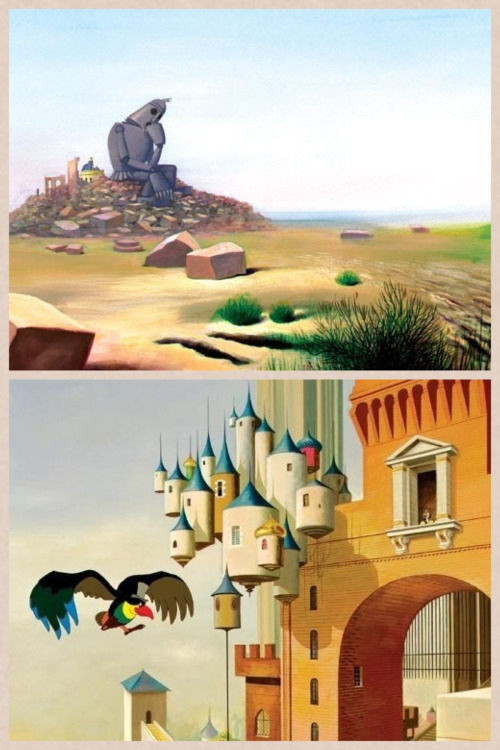 The 1952 version is dubbed as The Curious Adventures of Mr. Wonderbird and is available online for free. Since, the film was taken out of the two’s control, and was released. It caused the studio failure. Andre Sarrut who was the producer released it without permission, which caused a rift and made them go their separate ways. 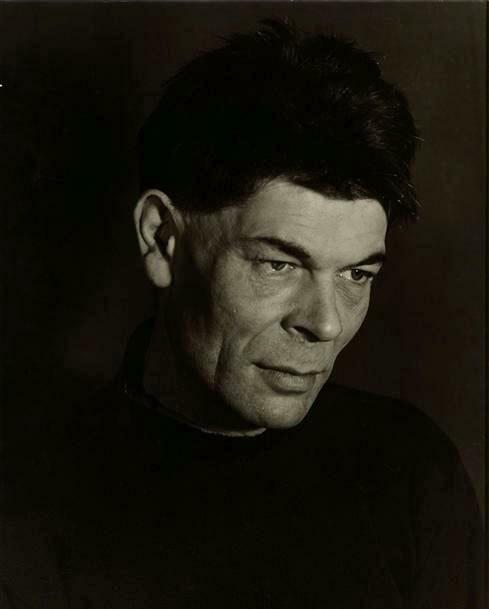 In 1967, Grimault regained possession of the film, and spent a decade trying to finance a new version under his supervision. By 1977, he arranged financing. Then in 1980 it was released under a new name, to differentiate it between the other. The music is by Wojciech Kilar (The Portrait of a Lady, Death and the Maiden). The Shepherdess and the Chimney Sweep is loosely based on The Shepherdess and the Chimney Sweep by Hans Christian Anderson. 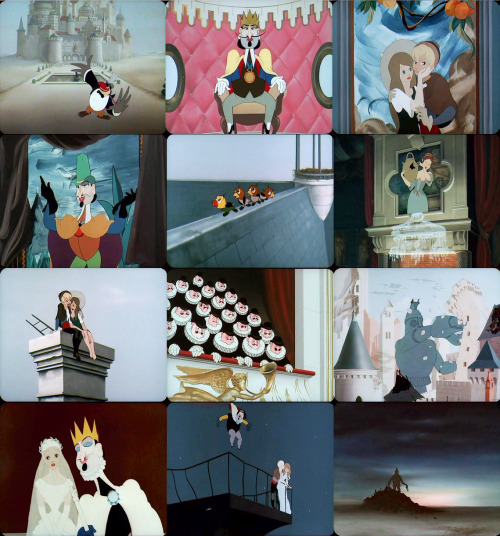 The film was nominated for the BAFTA award for Best Animated Film in 1958. It won the Venice Film Festival in 1952 for Honorable Mention- Paul Grimault and Special Jury Prize. It was nominated at the Venice Film Festival in 1952 for a Golden Lion. I believe that the movie takes place in Germany in the 1800s. The Mockingbird: The King’s worst enemy whom he constantly taunts. It is implied that the King may have killed his wife. He is the father of four baby chicks. King Charles XVI: The megalomaniac yet lonely tyrant who fell in love with the Shepherdess painting on his wall. The Shepherdess: She is in love with the chimney sweep painting on the right. The Chimney Sweep: He is in love with the Shepherdess painting. The Chief of Police- Extremely loyal to the King. 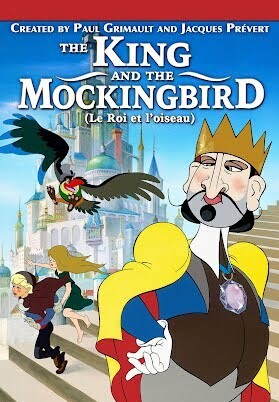 The movie is basically about a King who has a terrible relationship with a mockingbird. We suspect that he has killed the mockingbird’s wife and he is about to kill the mockingbird’s children, but the mockingbird saves them. It is time for bed and the King has a lot of art. The paintings come to life. The King’s painting likes the Shepherdess painting, but hates the Chimney Sweep painting. The Chimney Sweep and the Shepherdess painting like each other, so they run away together. The King’s painting tries to chase them, but loses them. So, he kidnaps the real King and sends the police to find them. The two meet the Mockingbird and become fast friends. Eventually, they are all caught. The King will feed the Chimney Sweep to the lions if the Shepherdess does not marry him. She agrees and he sends the other two to work. They fail, so he sends them to be eaten. But, the lions don’t eat them. They all escape and take down the King. But, he escapes with the Shepherdess. 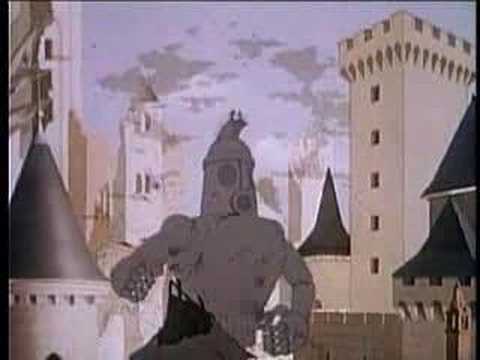 Then, eventually they catch up, defeat the King, and everyone lives happily ever after. The animation is well-done. There aren’t any songs, but the scores are really good. The story for the most part is well-done. There are a few flaws, but it isn’t anything too major. 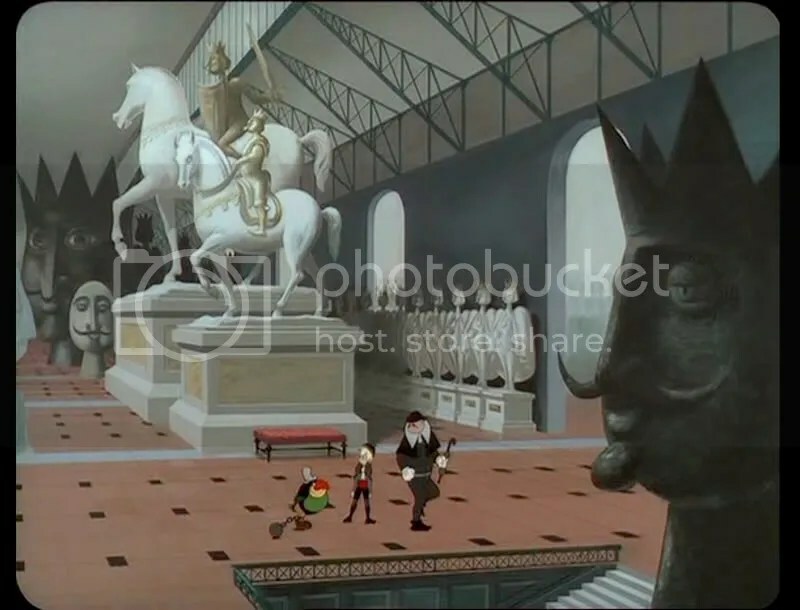 There is a scene in the movie where the paintings come to life and one of the paintings is a painting of the King. The King has a trap door built, and he runs away from the portrait. Then he just stands there at the exact spot until the portrait pushes the button. It was irritating, because how stupid can you be. He built it, so he knows it’s already there. I don’t understand why he would just stand there. Another thing that bothered me is that the movie clearly takes place before the 1900s. Yet, there is this airplane thing (it doesn’t look like an exact airplane, but close enough) and the airplane wasn’t invented until the early 1900s. So, how is this even possible? It shouldn’t be there, but it is. Also, there are parts where it can be kind of boring. But, it isn’t too bad especially for a movie in the 1950s. Most of the characters do not really have any character to them. They are very boring. The Shepherdess and the Chimney Sweep is a decent movie. It isn’t bad, but I wouldn’t rate it as good either. It would be like okay. The animation is well-done and the story for the most part holds up. The scores are done. There isn’t any music, but I guess not all movies need music. The movie has parts where it can get kind of boring, but it isn’t that bad. I neither like nor dislike the movie. There really isn’t anything to say about it. Overall, it isn’t something that I would watch again, nor would I recommend it to someone else. But, it is appropriate for children. So, I rate it as a B-. There are only two characters with actual personality: the King and the Mockingbird. The King was evil and not a character I would like. So, that just leaves the Mockingbird. He was funny and when he was grieving for his wife, you did truly feel sad for him. 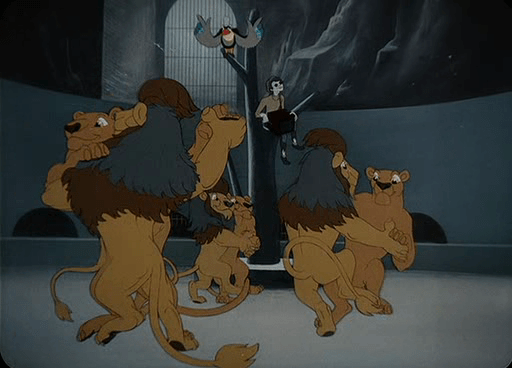 The Mockingbird and the audience think the lion is going to eat him. As, the lion goes down to eat him, instead he takes off his chains. The suspense was great and it was a funny scene. Because, the lion only cared about him being quiet. What did you think of the movie? What was your favorite scene? So, the next movie will be The Snow Maiden. It was directed by Ivan Ivanov-Vano and Aleksandra Snezhko-Blotskaya. It was produced by soyuzmultifilm in the Soviet Union in 1952. (I do not own pictures, videos, etc. My information came from Wikipedia and IMDB). I feel this is a movie/story that could do with a remake. Well, there is the 1980 version. Maybe, that one is better lol. But, yea the movie seemed to have potential, but guess we will see lol.